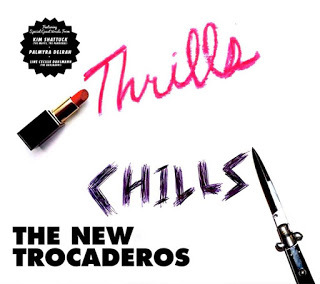 The New Trocaderos Deliver Non-Stop Thrills And Chills | Pop That Goes Crunch! This blog has championed the six previously released tracks by The New Trocaderos, the “supergroup” consisting of Brad Marino and Geoff Palmer of The Connection, and Kurt Baker. They scored a track on my list of the best 30 songs of 2014, and nabbed a spot on my list of the best EPs of 2014. I also had the opportunity recently to discuss the band and its future, with Michael Chaney, who primarily pens the lyrics, hooks and melodies that form the bases of the blistering, melodic, real rock ‘n’ roll The Trocs record. The Trocs just dropped their debut longplayer called Thrills & Chills, which, as advertised, delivers thrill-after-thrill-after-thrill — along with liberal doses of chills — spread over the course of twelve Chaney originals that alternate between glee, pathos, self-deprecation, anger, lust, passion, disinterest, and humor — sometimes swirling around in the same song. The sound this time is expanded greatly, with the addition of the occasional horn and harmonica, and inclusion of some of the finest backing vocals put down in quite some time courtesy of Palmyra Delran, Kim Shattuck and Line Cecile Dahlmann. Kris “Fingers” Rogers, who played on last year’s EP, returns to deliver tasty some keyboard lines, while The Connection’s Rick Orcutt pounds the drums with controlled abandoned. The festivities begin with a bang on the loud and unrestrained “What The Hell Did I Do,” with Marino assuming the voice of a misbegotten fellow finding himself tracked by the police after a particularly blurry lost weekend. Next up, “I’m So Bad” proudly flashes its influence, as Marino swaggers that “I drink a lot more booze than Keith” amid slinky slide guitar fills and a pounding, mid-tempo R&B beat. Close your eyes and “I’m So Bad” might as well be a lost track from Exile On Main Street. Thrills & Chills shows that Chaney can write, and The New Trocaderos can sing and play, in virtually any style that is part of the basic rock idiom — blues, country, rockabilly, jangle pop, power pop, doo-wop, punk rock, garage rock, etc., etc., etc. Put it all together and you get timeless rock ‘n’ roll for the modern world. Marino, Palmer and Baker also make their own each of the songs they sing, with their distinctive vocals and lead guitar playing placing indelible personal stamps onto Chaney’s fine compositions. Thrills & Chills is year-end Top 10 stuff. You can get Thrills & Chills right here. When you do — and there is no excuse not to get it immediately — turn it up way past 11, and sing along at the top of your lungs. Great happiness will ensue. Guaranteed.